While most of us dream of relaxing on a sun soaked beach or enjoying the sites of a vibrant city for our vacation, Webtec Development Engineer Peter Woodford has other ideas. Having abseiled, walked on fire, run several half marathons, rowed for 12 hours and driven a Formula Ford car what would be next on his ‘bucket list’? Just a trek up Everest that’s all! 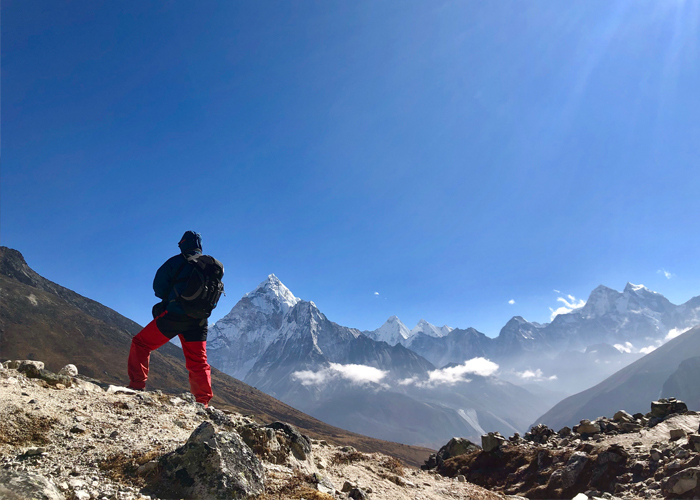 Peter started his latest adventure on the 3rd December and after arriving in Kathmandu he set out to tackle the trek to base camp on the 5th. Unlike in Summer when thousands of climbers can be found on the mountain only around 1000 tourists trek throughout December and Peter found himself in the minority as he was the only climber with his guides and in fact he only met four other groups with two or three trekkers all the time he was there. As Peter explained, “December is very cold and so are the guest houses reaching -25 Celsius at night and that is inside! There is only one burner in the canteen area which burns donkey and yak dung between 6 – 8pm, so you can imagine how frozen everything is”. When Peter reached basecamp although the experience was totally exhilarating he was also exhausted as being 5,365 meters in altitude gave him similar symptoms to bronchitis and made him unsteady, but he still managed to complete the climb and even found time to pose for a photo, which was taken at the memorial for lost climbers which is about 4,900 meters above sea level. When Peter was asked ‘what’s next’ he replied, “maybe the Northern Lights in Iceland, the little known Southern Lights in Antarctic, learning to play the drums and I am still training hard at rowing in his crew boat to get that elusive win at Henley Masters Rowing event in July”. Watch this space!